In this DVD Hristo Velev starts from the very beginning by explaining what Thinking Particles actually is and then begins to build upon a solid foundation of theory and technical knowledge of the program. From there Hristo goes through an extensive set of basic concepts to guide you through the massive amount of features in Thinking Particles. During that time he creates several practical effects that are very useful in production. After the basic concepts are covered he then goes through creating and entire project from start to finish to help you understand the entire process. With over 9 hours of training this DVD will help you understand Thinking Particles and start creating amazing effects. In this lecture the instructor demonstrates the digital sculpting and rendering of a classical style marble sculpture, showing how accurate anatomy and a dynamic pose combine to produce a professional and aesthetically pleasing result. In this novel approach to teaching anatomy, the instructor regularly overlays the model with anatomy images as he sculpts, which makes it easy to visualize how the underlying anatomy relates to the sculpted surface of the model. In this demonstration the instructor starts off by explaining the shot and then tracking the footage using Boujou. Once the live footage is tracked, its on to Maya to start blocking out the scene and incorporating CG elements. Everything from Ambient Occlusion, to Render Layers, to even Image Based Lighting is explained while in Maya. After all of the elements are rendered out of Maya, the last thing done is composing them together using Combustion and After Effects. This tutorial is perfect for those who want a solid foundation on how to take your 3D models and incorporate them seamlessly into Live Action video. 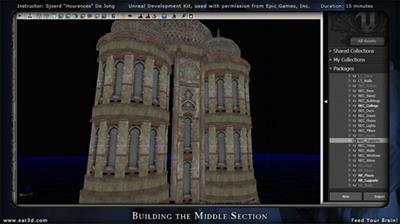 In this demonstration Sjoerd Hourences De Jong guides you through the Unreal Development Kit (UDK). Instead of giving a simple technical overview, Sjoerd uses over 10 years of personal and professional experience with Unreal Editor to create an entire exterior and interior environment from scratch. Along the way he explains many of the fundamentals about UDK and helps de-mystify many of its powerful features.